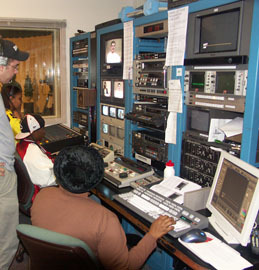 Waycross Community Media provides audio and video training (for a nominal fee). Residents of Forest Park and Greenhills receive FREE equipment use, FREE production support, and FREE cablecast/webcast of their programs. Not a resident? Equipment use/cablecast available to non-residents for a small annual Affiliate Producer fee. Production workshops in studio production, camcorder, and editing operation are offered at the studio - 2086 Waycross Road; one block off Hamilton Avenue near exit 36 of I-275. Waycross has camcorders and accessories for checkout. Residents and affiliate producers also have access to our three-camera studio and two editing suites. All facilities and equipment are available "first-come, first-served" to those completing the workshops. All that is required of any user is that we cablecast their non-commercial program. For more information about our workshops call 825-2429. ONE ON ONE ASSISTANCE: Once you complete a workshop, we will help you get started on your first project! Just make an appointment with our Trainer for a special one-on-one training session. Before you arrive -- you can download, print and fill-out the Workshop Application Form and for those under age 18, there is the Parental Consent/Liability Form. Schedule is subject to change. Please register ONLINE, call 825-2429 or email tony@waycross.org to reserve a place in a workshop as far in advance as possible. These sessions to fill up quickly. Workshop Materials Fee: $25 for residents of Forest Park and Greenhills, $50 for non-residents. Must be paid in full one week prior to the workshop to secure a space. If there are no paid registrations one week prior to the workshop, it will be cancelled. Pay online via Credit Card, or call us at 513-825-2429 to arrange a reservation by cash or check. A valid Drivers License must be presented the day of the class. The Workshop Materials Fee is non-refundable. However, it can be transferred to a future workshop if the participant cancels at least 24 hours in advance. The future workshop must be identified and booked at the time of the cancellation.